Grey Goose Vodka & Kahlua Mocha with Half & Half. A new spin off an old classic. Stolichnaya Vodka, Patron XO Coffee Liqueur & Bailey’s Caramel with Half & Half. Stolichnaya Vanilla, Kahlua Vanilla & Gran Marnier with Half & Half and Orange Juice. Garnished with a fresh slice of orange. 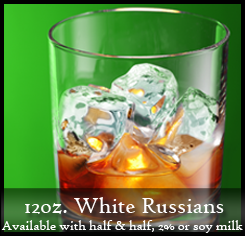 Stolichnaya Razberi Vodka, Kahlua Hazelnut & Bailey’s Irish Cream with Half & Half. Grey Goose Vodka, Kahlua, Bailey’s Mint & Creme De Menthe with Half & Half.